FK Lowry Piling were subcontracted by locally based Mascott Construction to design and install 450mm Diameter CFA Piles to depths up to 25m for axial loads of up to 750kN in Belfast City Centre. Ground conditions on the project typically consisted of Made Ground overlying soft alluvial deposits (Belfast Sleech) overlying firm to stiff Belfast Clays. FK Lowry Piling deployed their latest rig, the Soilmec SR-95 to undertake the works. 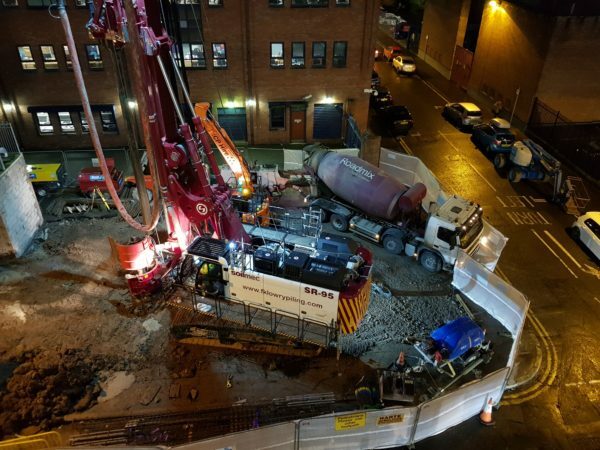 FK Lowry Piling’s Contracts Engineer, Jonathan Pearson explains, “The Montgomery Street Project was an opportunity to test our new Soilmec SR-95 in Belfast Ground Conditions. As it had previously been undertaking Rotary Bored Piling on the A6 Road Scheme, we were keen to see how the rig performed in CFA Mode. Following the quick-change rig conversion, we were impressed by the rigs CFA capability and look forward to undertaking similar work with this 95t Rig”. FK Lowry Piling continue to operate a fleet of Precast, CFA, Rotary and Bored Displacement Piling Rigs throughout the UK & Ireland.